It's not really a statistically relevant sample, but over the years, I've seen quite a few lawyers speak. And I have to say that pretty much all of them are still using text-heavy slides and not a lot of visuals. Yet at the same time, these talks are often pretty good; they're informative and even entertaining. Why is that so? Now law, we non-lawyers would all agree, is a complicated matter. That's why you need experts - lawyers - and that's why there are talks about specific aspects that are relevant for specific audiences, e.g. startups (What do you have to be careful about when starting a business? 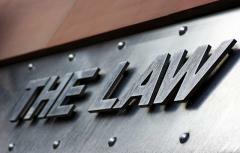 ), web designers (What are the legal requirements for a website? ), and so on. Lawyers are used to explaining things to laypersons. That alone is a great exercise, one that I would recommend to any expert: Try to explain what it is that you do or what you're currently working on to someone who's from a completely different field. Obviously, you can't just cram everything you learned over the years in just a few sentences. So instead you try and compare things from your world to everyday objects or something that your listener is familiar with. It also forces you to think about why things are done in a certain way. Is there a philosophy or an overarching concept behind it all? Have you ever really thought about these things? The other reason why lawyer talks are often good and entertaining is because they have access to a lot of examples; lawsuits make for good stories. They can be insightful and help the audience understand why a specific law is like it is, exposing the overall idea behind a certain area of law. And often enough, they are just entertaining, when someone runs a particularly absurd or outrageous lawsuit or just demonstrates a misguided understanding of law and how it should work. These two elements, being good at (and used to) explaining things and having interesting and insightful examples and stories, are qualities that make up a good talk and a good speaker; and that's not limited to lawyers. And the slides? Sure, they could be better. One thing that comes with the job is of course that law is almost entirely text and the content of that text is often very abstract. There's not much that you could show on a slide, other than the text of the law (which is often also the point you're talking about). You will often need to tell people that something important is in paragraph 7, section 9 of this or that law; text, again. Still, I see the potential to use the occasional image when talking about guiding principles and ideas behind a certain law or a certain case. And, of course, the lawsuits themselves offer an opportunity to show visuals, e.g. of the product that the lawsuit was about. In summary: Don't copy the slides lawyers use, but see what you can learn from their way of explaining things. And please do copy their use of stories and examples to make their point. If you're a lawyer: Good work there, but please do try to reduce the text a bit more and include the occasional visual. Your audience does need a bit of (eye-)rest between all that text. "Why Lawyers Can Get Away with Bad Slides" by Dirk Haun is licensed under a Creative Commons Attribution-ShareAlike 4.0 International Licence.